You know it’s crucial to stay top-of-mind with your database. But you may be wondering how to make the 33 annual touches Gary Keller recommends without annoying the people in your sphere of influence. Is there a way to drive real estate business AND give back to the community? To stay in front of your list AND make a positive impact? The answer is yes, and one popular strategy is to build your brand through client events. Dan Baltzer leads a team of 40-plus agents with Realty Group in the Minneapolis-St. Paul area. He is also a coach with Club Wealth and a rock star when it comes to hosting engaging events for his clients and community. Dan is committed to making a positive impact and building his brand from a place of contribution. Today, Dan joins me to explain how to create experiences that people will remember—and build your brand in the process. He offers insight around who to invite and how to plan and promote an event of any size, sharing the case study of a recent megaevent his team held at an ice rink over the holidays. 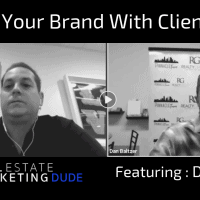 Dan also describes his ‘guide their feet’ approach to building your brand at events and discusses how to leverage partnerships to make experiences more affordable. Listen in for Dan’s advice around creating an engaging experience and learn how to use events to drive business and contribute to your community! Message Dan through Facebook at facebook.com/dan.baltzer, and check out his coaching page on Club Wealth at clubwealth.com/about/meet-our-coaches/dan-baltzer.